SHANGHAI, March 13, 2019 /PRNewswire/ --During electronica China in ShanghaiMarch 20-22, 2019, visitors are encouraged to stop by Digi-Key Electronics' booth located at E5.5527 for the chance to learn about the new WeChat interaction promotion, as well as receive free gifts, including a new designed foldable backpack and mobile phone card holder. The company will also have representatives available to talk with guests about how Digi-Key's breadth of product, tools, and services can help with any design or project. "We are looking forward to engaging and interacting with our customers and letting them know how we're working hard to ensure our website and resources are designed to fully enhance our digital relationship with them," said Tony Ng, Vice President, Global Sales. "We hope our customers will use our WeChat Official Account to interact with us on a daily basis, as well as get the technical information they need to help them in every stage of their design journey." 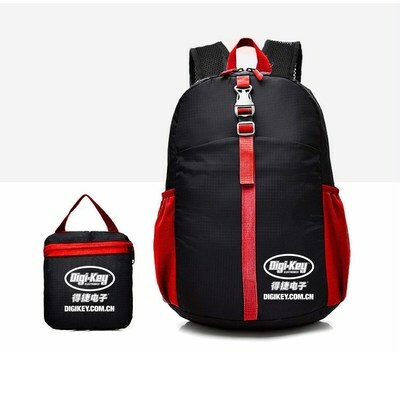 Guests who follow Digi-Key's WeChat official account and submit an entry are eligible to get a free foldable backpack. Four weeks after the event, 200 followers will be rewarded with a QQ Music 1-month membership. Also, visitors who participate in a special WeChat activity will receive a Digi-Key mobile phone card holder. Digi-Key is an authorized distributor for over 750 quality name-brand manufacturers and offers more than 8.2 million products on their website with 1.6 million in-stock and available for immediate shipment. For more information, please visit the Digi-Key website.